“If your pictures aren’t good enough, you’re not close enough,” Robert Capa once said. Unfortunately for the poor bugger, he got too close to a landmine one day. Still, this is one of my favourite ever quotes. While he was clearly talking about getting close to your subjects – he was on one of the barges which landed on the Normandy beaches for D-Day – I also like to think that to get closer to the world is also to improve your photography. And that’s what the SOTM World Tour did for me. It took me out into places I’d never heard of, to busy, neon-stained alleyways, across African plains with skies that last forever and fighting arenas stacked with sweating, shrieking, betting-slip brandishing crowds. These are ten of my favourite images from my year-long trip around the world, from the many thousands that I took with my Nikon D5100, my iPhone 4S and then, toward the end, my Nikon D7100 after my 5100 fell apart. It was only a few months old but I guess world travel was just too much for it. I’ve only ever self-taught myself how to take pictures, and being out in the world was the best lesson of all. 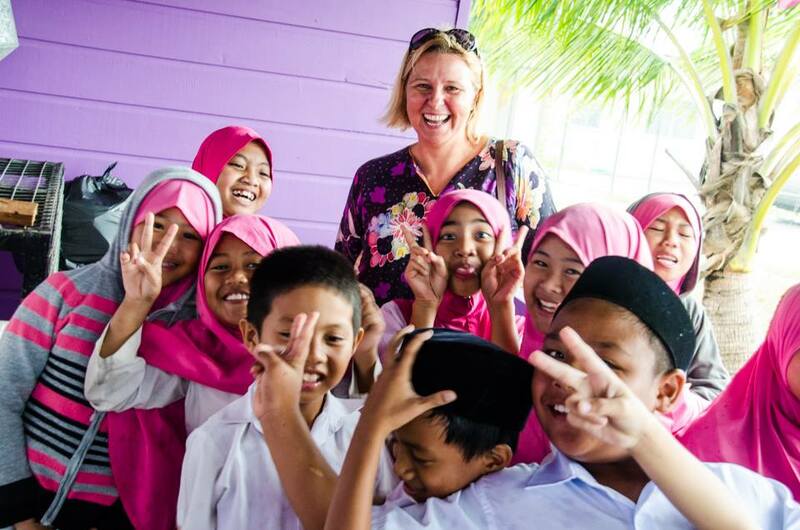 The top image shows pupils from Sekolah Rendah Batu Marang school, in Jalan Batu Marang water village, Brunei. The charming Kathy Wharton is their English teacher and she kindly took us around, showing us her school and the water village, perched on top of perilous-looking stilts, where her charges come from. After I posted some of these images on Facebook my friend Helen, with whom I stayed, told me I’d “captured the real Brunei”. Which pleased me greatly. The throbbing Shibuya Crossing, in the heart of Tokyo, has many smaller roads and alleyways running away from its busyness. The gentleman above was the waiter in a noodle place, cheap and very tasty, in one of these veins. I fully intended to return, so good was the food, but was distracted by Tokyo’s many other shiny attractions and never made it back. So it’s fortunate that I did ask him for a photo upon my only visit. 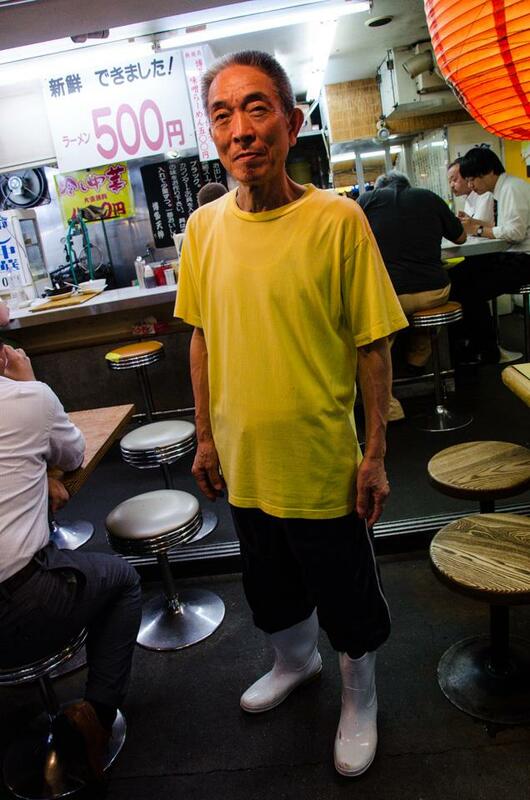 He didn’t speak English but when I smiled and pointed at my camera, posed with great confidence and grace. And I liked his white wellies. When in Port Elizabeth, South Africa, I was taken to the remarkable Shamwari Game Reserve by my friend Kimberley. There I went on three safari rides and was overwhelmed with the beauty of the place. One time we spotted a serval hiding in the bushes. I saw it twitch through my viewfinder and instinctively pressed the shutter. When I looked at the screen afterwards, this shot is what I saw. It’s my best action photo, I think. There isn’t that much to do in Geneva. It’s pretty enough and very clean, but a bit too sanitised for my liking. 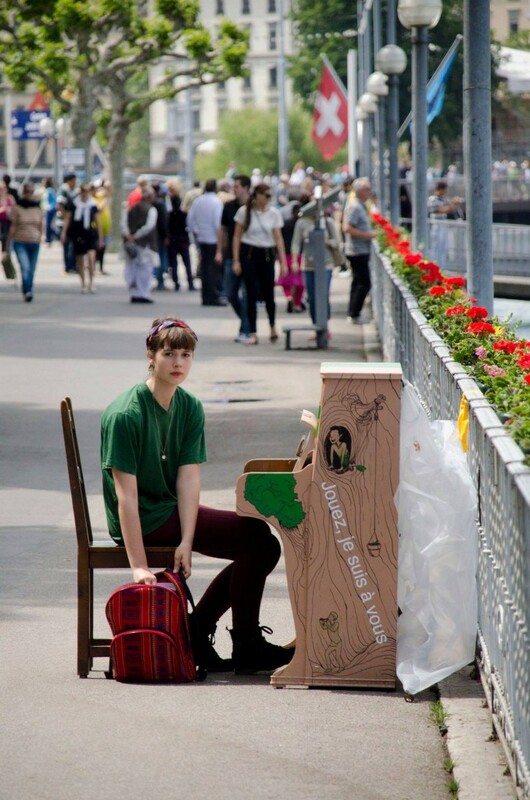 But at least Lake Geneva has public pianos for people to tinkle. I saw this young woman sat at one while delving into her bag. My camera was completely the wrong exposure levels so I was rapidly adjusting dials, willing her to hold her position for a few seconds longer – when she looked up. I knew my exposure was wrong, but took the shot as I liked what I saw in my viewfinder. The moment then passed. I looked at the image I’d taken and it was virtually black, totally underexposed. But as I was shooting in RAW I had hope. When I got it onto my computer, I was able to change the exposure – and was thrilled with how it turned out. So if you’re not shooting in RAW, you should consider doing so. There may come a time when it will save you. 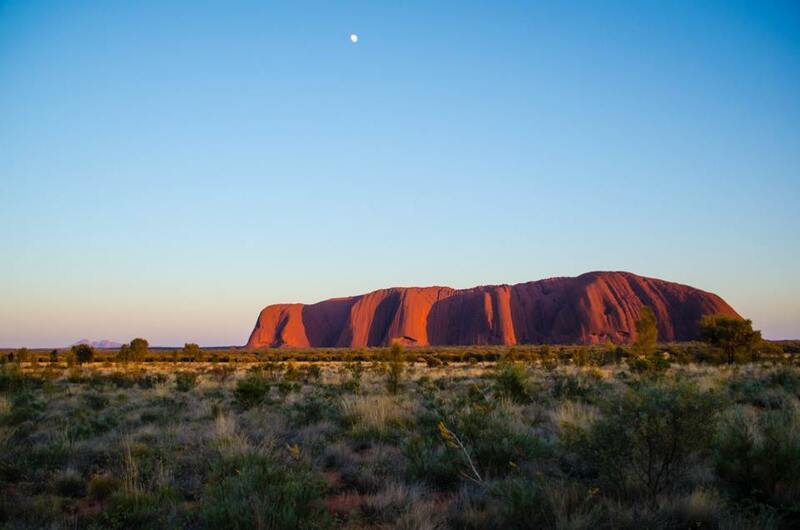 I have always wanted to visit Uluru, fairly in the centre of Australia’s outback. When I was a boy it was more commonly known as Ayers Rock. But even though I was enthusiastic about it, I was still hugely surprised about just how hypnotic it is. Enormous, red, hugely different to the landscape around it, a monstrous pimple squeezed up from the earth, back when the planet was still being formed. Looking at the rock during sunrise and sunset is to experience kaleidoscopic colours and shapeshifting shadows. You might think staring at a large rock can’t be that exciting, but somehow, it is. You’ll never feel old again when you consider how what stands before you came into being more than 600 million years ago. Also, about 2.5km of Uluru is buried below the desert soil. Mind. Boggled. I chose the shot above because I got Kata Tjuta in the background, once known as the Olgas. They’re a collection of 36 domes and in many ways are even more remarkable than their neighbour. She’s the flashy one, who puts out with her russet looks, getting most of the attention, hogs all the postcards, while Kata Tjuta is visited as something of an afterthought, an added extra for tourists who’ve come to see the hot girl in the neighbourhood. But I loved them both. The Lumpinee stadium is beautiful because it’s fragile. It’s about to be knocked down and relocated, which makes the sweating, kicking, yelling all that more intense. Like the last time you make love to someone you’re soon to part from, you savour everything because you know it won’t happen again. Their imperfections become adorable because it’s about to be all over. Built in Bangkok in 1956, the stadium looks like it might not last too much longer. 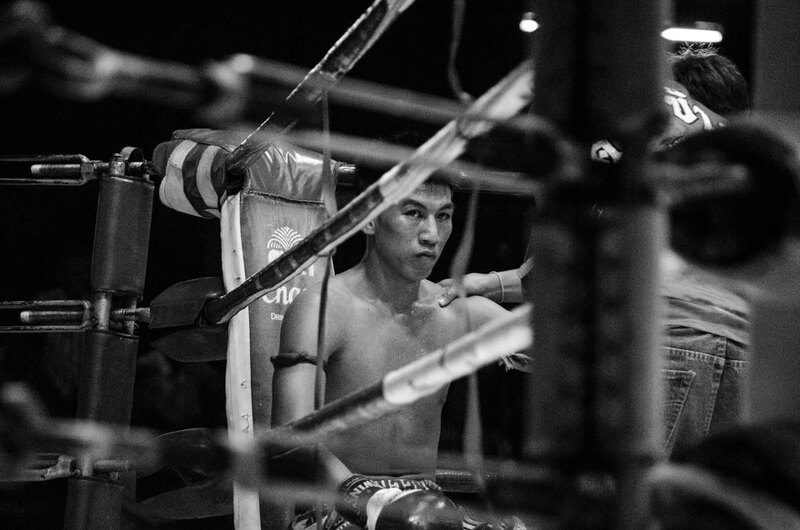 Look away from the shiny ring, where respectful Muay Thai fighter knee and punch and kick one another. The apparently leaky ceiling is made of corrugated sheets, with many long-stemmed fans shivering like leaves on a trembling pond. The cheap seats aren’t even seats, they’re benches and people just stand anyway. And the VIP seats are just part-plastic chairs, although they do afford an excellent view of the action. Despite this, I really wanted to move into better positions but was restricted to shooting where I was perched. As a result, my 18-200mm Sigma lens came in handy, and of all the shots I got that night, this was my favourite. I turned it grayscale to add a bit more mood to the young man’s determined glare. I was on a food tour in Hong Kong and was taken to a dim sum place for breakfast by the smashing Laura, who runs Hello Hong Kong Tours. It was a local place for local people, and I loved it immediately. It’s one of the places in Hong Kong that still has people pushing food carts round, which supply you with your choice of dishes. 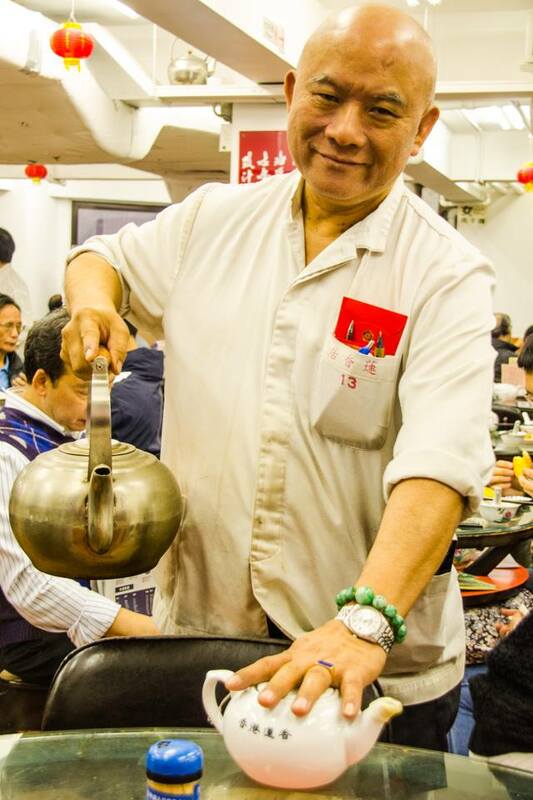 While there I spotted this chap walking around with a big metal kettle, topping up the ubiquitous Chinese tea that sloshes around in eateries all over the city. I was desperate to photograph him, he looked fantastic. I grabbed some half decent shots of him at the next table, and then suddenly, out of nowhere he shimmered and appeared at our table, directly opposite me. I managed to take this photo, and then another. I preferred the second image, but it’s not pin sharp because the focal point was over his shoulder. So after suffering that slight disappointment, I decided to have my camera on autofocus sometimes, especially in an unpredictable environment, to ensure that focus isn’t an issue at least. We all laughed, and he said: “No, seriously, you have to pay me.” But he was joking, and when we left I shook his hand. It was like a lobster with a grudge. There’s nothing so good for the soul as seeing a happy elephant. There are plenty of these at the Elephant Nature Park near Chiang Mai, Thailand. These remarkable, beautiful creatures have been abused at some point, often by some of those in Thailand’s logging industry. The guilty ones must have black souls. Eye-gouging, beatings, pelvises broken by forced matings, the stories run a chill though your blood. 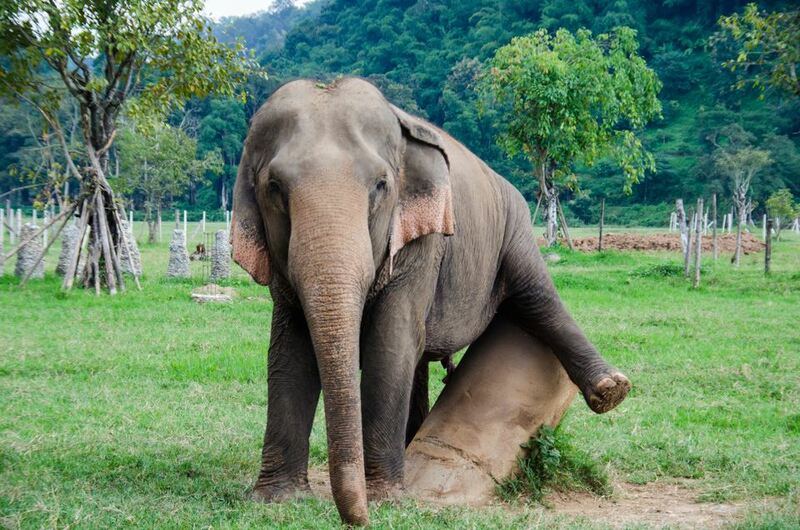 And if you ever want to ride an elephant, do bear in mind that they are beaten and broken as babies, treated horribly, in order to get them to allow humans to ride them – so don’t. At least they are happy here in this sanctuary. This chap was having a damn good scratch of his nads on this concrete pole. Or it might be a female. I was too polite to ask. 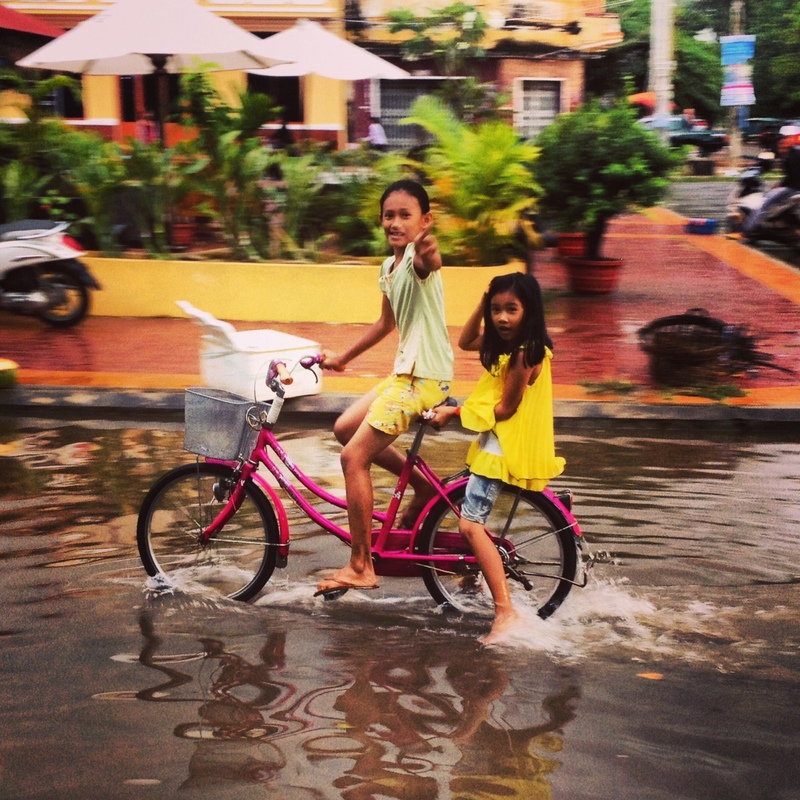 We were out of Kampot, at the very bottom of Cambodia, when a tremendous storm shattered overhead. After making it back via a slightly traumatic tuk tuk journey, we found the town flooded. This is a common occurrence in these parts, and the population were clicking into gear, chucking out buckets of floodwater from shops and restaurants, using squeegees to push back the tides in a well-practiced fashion. The local children seemed to delight in all the fuss. These two characters were going up and down the flooded road, so I got several shots of them with my camera. But this one was the first that I got, grabbed with my iPhone as they rode past and run through an Instagram filter. It’s not totally sharp but captures their spirit best of all the ones that I took. 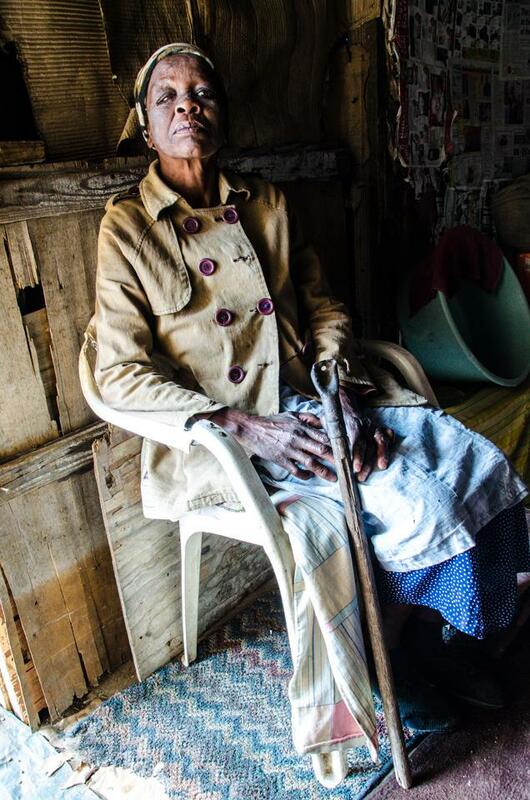 This lady lives in a shack in Missionvale township in Port Elizabeth, South Africa. She lives alone and says she is lonely. Someone told me later that her husband had died in a fire after they lit a stove indoors, which also destroyed all her possessions. She is also HIV positive and washes clothes for her neighbours, in exchange for food so she can go on living. She has had her room tidied up by Missionvale Care Centre, a charity which does incredible work in the community. The floor is mud, so they’ve put mats down, but when it rains the ground is still soggy beneath her feet. The roof leaks also. The light was perfect as she sat near the doorway, so I took her photo with her permission. I’m very fond of it, and yet it upsets me whenever I look at it. The world is both a beautiful canvas to work with and a terrible sight to see. Thank you for looking at my pictures. This entry was posted on Thursday, July 3rd, 2014 at 3:33 pm	and is filed under SOTM World Tour. You can follow any responses to this entry through the RSS 2.0 feed. You can leave a response, or trackback from your own site. The shot of the two Cambodian kids is my favourite here. Closely followed, obviously, by that moody Thai fighter. Swoon. 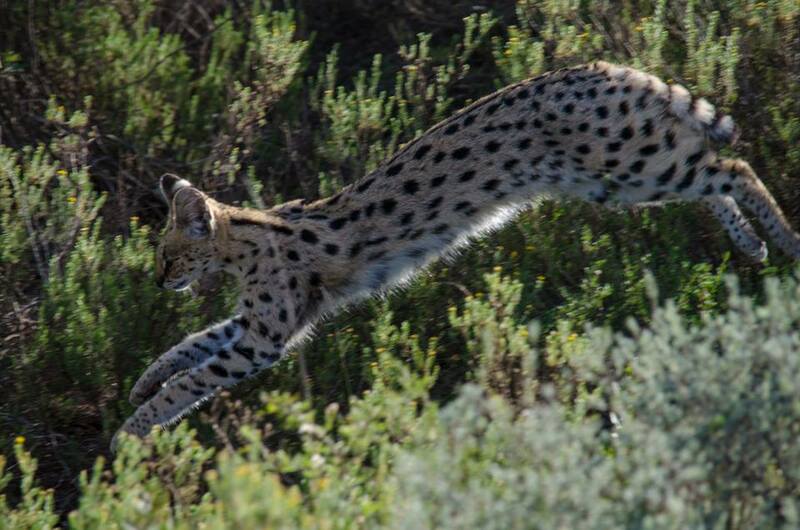 Great shots, and nice one of the serval, too – I love it when animals cooperate. Conversely, a dog just tried to chomp my finger off. I don’t like it when they don’t cooperate.